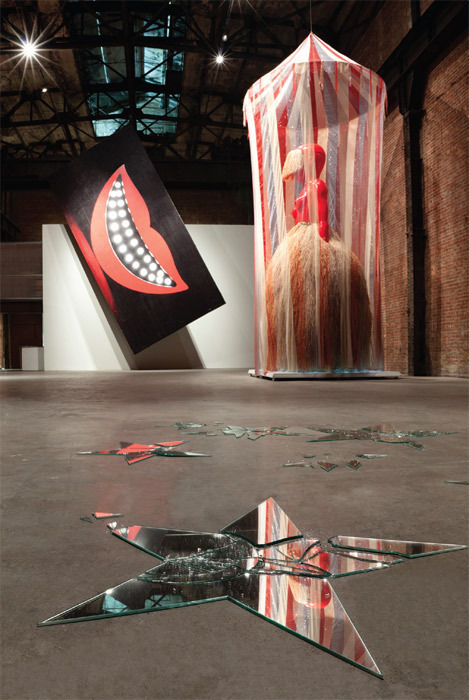 View of “Sanford Biggers: Cosmic Voodoo Circus,” 2011. Foreground: Constellation 6.0, 2011. Background, from left: Cheshire (On Tilt), 2010–11; A Jóia Do Orixá (To the Jewel of the Orixa), 2011. Sanford Biggers’s art fixates on recurring symbolstrees, carnival, musicians, and a bodiless smile that is part minstrel, part Cheshire cat, and part logo for a conglomerate whose name might be “history.” Two concurrent exhibitions with works spanning 2002 to the present explored these emblems vis-à-vis legacies of violence that constrain the powers and desires of black men. At times, Biggers’s ruminations sit uneasily inside a glamorized stagecraft. At best, grim knowledge makes his magic potent.